I am a definite fan of Hosseini’s storytelling so I was looking forward to reading his latest book. I had some trepidation though too. ‘The Kite Runner’ was a hard but astonishing story which was clearly critical of Taliban-run Afghanistan. ‘A Thousand Splendid Suns’ broadened the perspective to reflect on life under the Russians and earlier but was critical of extreme Islamic cultural thinking. It was obvious that ‘And the Mountains Echoed’ would also be about Afghanistan but I feared that if this was to be another veiled critique of Afghan culture and history that Hosseini would lose his power by repetition. “Was this,” I wondered, ” the last book I would bother to read by this author?” I had no wish to be tired of this wonderful storyteller. Let me be clear: I’m not criticising his previous books – they are marvellous and ‘A Thousand Splendid Suns’ may possibly be my favourite book of the 21st century – but a third covering same ground would just make the author an exceptionally good, but disappointing, one-trick pony. From the very second I began the book (I deliberately try to know as little as possible about novels before I read them – I want to drink in the mystery as I get to know the characters) I was bewildered and enchanted. I had absolutely no clue where this story was going as we began with a folktale of monsters carting off children from villages. The second chapter gave me little idea what was happening either. It was only with the third chapter that I started to twig on to Hosseini’s technique. I was already hooked by then, but now I was sitting up and taking notice as a fellow writer. In short, ‘And the Mountains Echoed’ is a collection of short stories. Yet it is a novel too. Like a venn diagram, each chapter is a circle around a different character telling their own complete and personal story. Yet, the circles merge together – some more deeply; others merely ‘dip in’. The result is a central intersection where the story of the whole is buried. It is, without exaggeration, a masterpiece. I can only compare the work to the music of Debussy – who created architecturally flawless works in structure and harmony, yet produced music of sublime beauty thus combining mathematical thinking with artistry. Hosseini does the same. Were I to meet the man I think I might actually bow at his feet. How can I, as a writer, even begin to compete? Furthermore, though indeed the novel centres (or perhaps circles) around Afghanistan – Kabul specifically – Hosseini has moved away from criticism. Yes extremities of Islamic culture and corruption is there, yes the Taliban era is there too, but the focus is entirely on the hearts and minds, the heroism and the failings of people. Ultimately it is about love and loss and the reality that some stories only partially close and sometimes don’t close at all. Most poignant for me was chapter five which I believe should be required reading for all foreigners going to do charity or voluntary work short-term in another country. As one who did so in Bangladesh for six years and seen many others come and go before, during and since my time there, I have seen this chapter played out time and time again and, I confess, it is one I struggle with daily not to allow to be my story too. Far then from being the last book of Hosseini’s that I will read, ‘And the Mountains Echoed’ has confirmed that this author is one of the finest writers alive today. His writing is sublimely beautiful and his storytelling flawless. As I’ve often mentioned before in my reviews, the sign of a good novel is, for me, that I care what happens to the characters after the last page is turned. Hosseini manages this with every single chapter – I want to meet and hold tightly each and every one of the narrators of this tale. Never before have I felt so much empathy with so many in one go. I didn’t think ‘A Thousand Splendid Suns’ could be beaten. It has been at least matched. Social Entrepreneur, educationalist, bestselling author and journalist, D K Powell is the author of the bestselling collection of literary short stories “The Old Man on the Beach“. His first book, ‘Sonali’ is a photo-memoir journal of life in Bangladesh and has been highly praised by the Bangladeshi diaspora worldwide. Students learning the Bengali language have also valued the English/Bengali translations on every page. 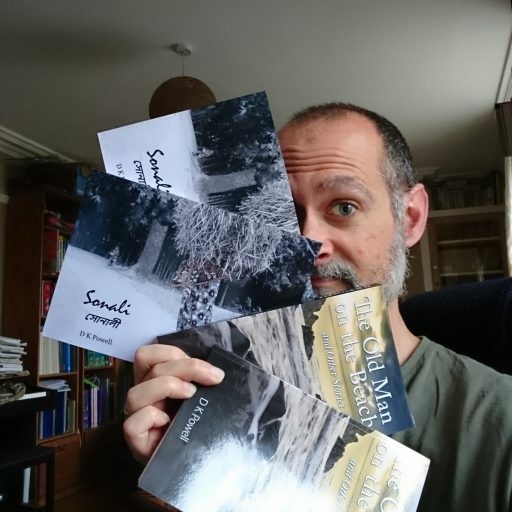 Both ‘The Old Man on the Beach’ and ‘Sonali’ are available on Amazon for kindle and paperback. Published by Shopno Sriti Media. Ken writes for a number of publications around the world. Past reviewer for Paste magazine, The Doughnut, E2D and United Airways, and currently reviews for Lancashire Life magazine. I shall try to look it out! I finished reading it today and the ending totally made me tear up! The fifth chapter moved me deeply. I actually looked up volunteering organizations in my city and am planning on joining one soon. Buy ‘Old Man on the Beach’ here!